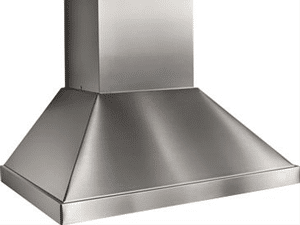 Chimney hoods are triangular shaped, European inspired vents. 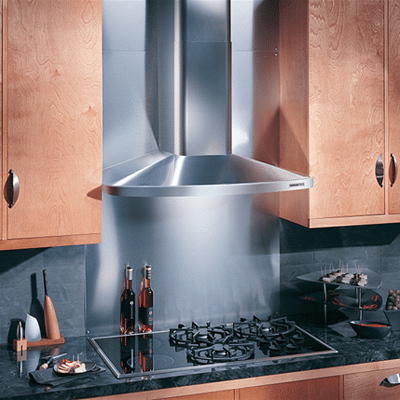 They are considered the most attractive hood option and often are the focal point of the kitchen. There are two considerations for any vent. The primary function function of the hood is to remove steam, grease, smoke and odors that can stain walls and damage cabinets. 4 gallons of grease can accumulate in a poorly vented kitchen per year. Venting is about the right size hood, good blower speed or CFM as well as good ducting to push the smoke and heat. We cover all that in the Yale Ventilation Buyers Guide. The second function is style. As I said before, chimney hoods are the best looking of all ventilation. Let's look at the top 5. 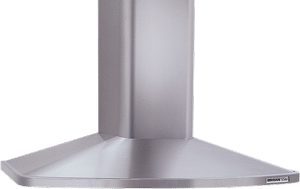 Yale has a non-branded chimney style hood exclusively manufactured to the highest quality standards at a reasonable price. There is no logo on it so it will match with many brands of appliances. If you're venting the hood to the outside this will be good for any free standing, slide-in-range, or a 30” professional range. 3-Speed easy to use electronic controls located on the front center of the hood. If you set this on medium and you want to shut the hood off, you can go directly to the power button. With other brands you need to scroll through the different power levels to shut the hood off. (2) 50-watt halogen bulbs in the front of the hood that covers the total cooking service and also comes with 2 mesh filters that are easy to take in and out and safe to wash in the dishwasher. 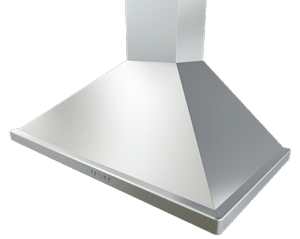 Zephyr Ventilation, a division of Nortek, started to manufacture vent hoods in 1997 by the founder Alex Siow. 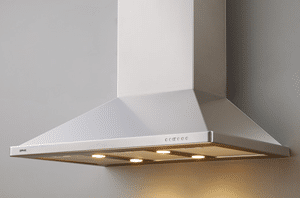 Mr. Siow developed professional-grade hoods for the home. The first series were called Power-Series. 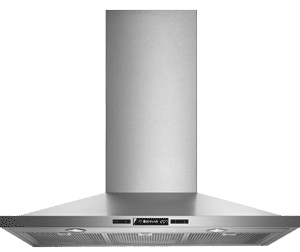 These hoods had higher CFM’s with better air quality and self-cleaning filter-free technologies never available before. In 2000, Zephyr introduced the Europa Collection with different types of designs that gave some style over the range. This Venezia ZVE-E30S is part of the Europa Collection. 715CFM blower that vents to the outside or re-circulate. It has great amount of power compared to similar types in its class. 24” deep which gives you a better capture area. A unique feature is the DCBL Suppression System which uses a DC brushless motor that uses 77% less energy. This makes it one of the quietest hoods on the market. Multi-level LED lights which doesn't get hot and has a 68 year life span. The control panel is like a circuit board in a computer system. It controls the DCBL Suppression System, user interface, LED controls and the DC motor controller while managing the distribution of energy to the different components. Jenn-Air was founded in 1947 by Louis Jenn in Indianapolis, Indiana. The company started out by manufacturing and marketing industrial fans to be used in commercial and industrial applications. In 1961, they designed a fan which can be integrated with a cooktop range. This was the first downdraft vented range. This became a revolutionary idea in the appliance industry. Jenn-Air was also amongst the first to offer convection in ovens. Maytag Corporation purchased the Jenn-Air brand. When Maytag Corporation started failing, the company was then sold to Whirlpool. Jenn-Air has become popular with a 300 million dollar investment in cooking, most notably wall ovens and professional ranges from its parent company. The history of Broan ventilation systems started back in 1932 when Henry Broan first developed and produced a kitchen fan named the “Motordor Fan”. Broan manufactures a large variety of residential ventilation products like kitchen range hoods, indoor air quality products and ventilation fans. In 2000, Broan Mfg. Co., Inc. turned into Broan-NuTone LLC, after merging with Aubrey Manufacturing, Inc., Rangaire LP and NuTone Inc.
Comes with (2) 20-watt halogen bulbs with only one light level. Most hoods in this class have 50 watt halogen bulbs with two different settings. Comes with two aluminum filters which are dishwasher safe. 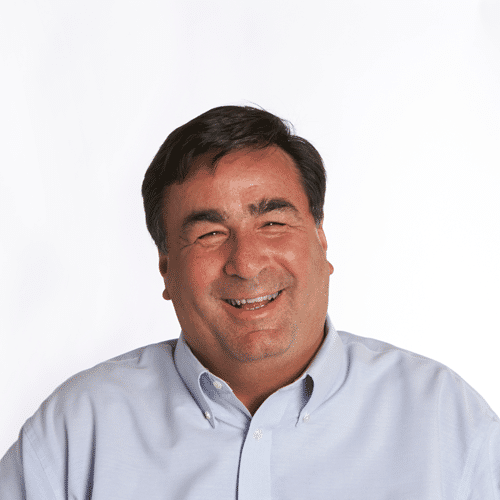 Best is a division of the Nortek Companies which is based in Providence RI. Nortek is the manufacture and developer of Residential Ventilation, Technology Solutions, Display Mount Solutions, Residential Heating and Cooling, and Commercial Air Solutions. The Broan hood is the lowest cost, but has less CFM power, and wattage on the bulbs. The fit and finish is not as nice as other chimney hoods. great lighting. The quality of the hood is very good as as the overall styling but you are paying a hefty price. I really like the Zephyr. It has the highest CFM at 715. The hood has great lighting with LED bulbs. It's also deeper so there is more capture space. The controls are more complicated to use since you have to scroll through the different levels to determine what setting you want to be on. The Jenn-Air is a nice hood. It has a nice fit and finish with good lighting and 600CFM. The only problem like the others is scrolling the control to turn the hood off and on. Believe it or not, some people do not like the large Jenn-Air logo at eye level. Last but not least is the Yale non-branded vent hood. I like this hood. It has good lighting, a good overall fit and finish, but best of all is a great value for the price. Download the Yale Ventilation Buyers Guide with specs, features and inside tips on how to properly size as well as duct any hood. Well over 40,000 people have read a Yale Guide.